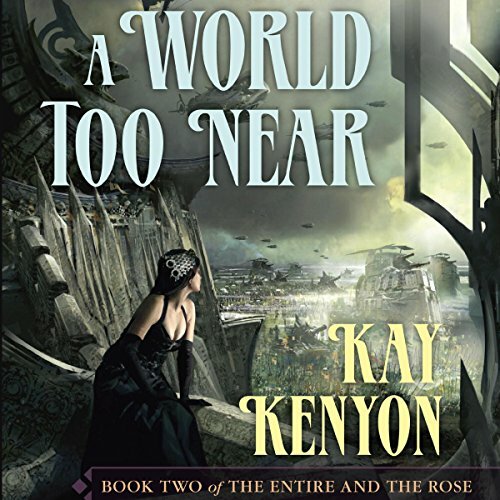 In Bright of the Sky, Kay Kenyon introduced a milieu unique in science fiction and fantasy: The Entire, a five-armed radial universe that exists in a dimension without stars and planets and is parallel to our own universe. Stretched over The Entire is a lid of plasma, called the "bright", which ebbs and flows, bringing day and twilight. Under the vast canopy of the bright live many galactic species, copied from our own universe. Former star pilot Titus Quinn loves The Entire, but now he must risk annihilating it by destroying the fortress of Ahnenhoon. To sustain a faltering Entire, Ahnenhoon's great engine will soon reach through the brane separating the universes and consume our own universe in a concentrated ball of fire. Quinn sets off on a journey across The Entire armed with the nan, a small ankle bracelet containing nanoscale military technology that can reduce Ahnenhoon and its deadly engine to chaos. He must pursue his mission even though his wife is held prisoner in Ahnenhoon and his own daughter has sent the assassin MoTi to hunt him down. As Quinn wrestles with looming disaster and approaches the fabled concentric rings of Ahnenhoon's defenses, he learns that in the Entire, nothing is what it appears. Its denizens are all harboring secrets, and the greatest of these is the nature of the Entire itself. ©2008 Kay Kenyon (P)2008 Audible, Inc. This series is a fairly interesting listen. The narrator has depth and breadth. Meaning that the characters voices are both well differentiated and well suited to each character. The story itself is complex enough to keep you interested without becoming so entangled that you lose track of the stories events. The villains are hate able with just enough of like-ability to keep them from becoming caricatures. The hero is likable but dislikable enough to prevent him from becoming another over grown boy scout. The world(s) are fully fleshed and believable. The prose itself is not exactly Shakespeare but it is adequate enough for the story. Overall I enjoyed the story but was not overwhelmed with enthusiasm, but this is not my usual genre so that actually might be a ringing endorsement of how good the book is. Overall I recommend it.